Its simple brick and stucco ranch exterior belies the stunning architectural features and creature comforts in this luxury dream home that enjoys incredible front range views. This unique home boasts open floor plans w/ vaulted ceilings and lofts on the main floor AND a luxury in-law suite and rec room w/ wet bar in its finished walk-out basement that takes advantage of beautiful views and exterior light available from its oversized windows. 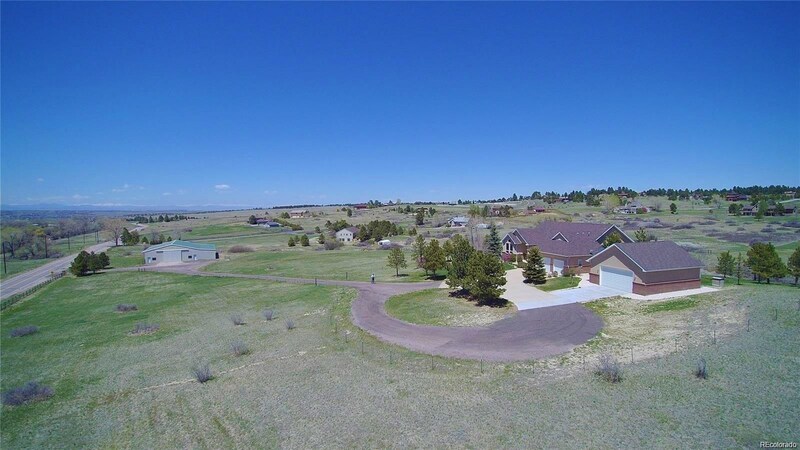 This magnificent home sits on an 8 acre NON-HOA EQUESTRIAN property (domestic well) located just 2 miles from the Colorado Horse Park and Ponderosa High school. The 4500 sq ft insulated steel framed barn/indoor arena has massive doors that allow access to RVs and other large equipment, making it an ideal multiuse structure. A 1000 sq ft detached insulated garage compliments the 3-car attached garage. This property has way too many features to describe in the MLS listing.